Herein are all the great neurological scripts of the past synthesized and modernized for our day: the Tarot. Cabala. The Hindu Chakra System. Alchemy. And here, too – praise be to the Sun Absolute! — is a refreshing absence of the cant, the pomposity and the deliberate mystification that makes most books on those subjects virtually unreadable. Antero Alli has chosen to organize his system around the 8 circuits of the brain, as described by Dr. Timothy Leary in ExoPsychology and other books. Many will object to this because they do not like what they have read about Dr. Leary in the newspapers. This mechanical reaction, or conditioned reflex, is no longer necessary. (See The New Inquisition Falcon Press). Dr. Leary is in the process of having his name legally changed to Irving Blum. Thus the ideas of the 8 brain circuits can now be considered on their own merits without the distraction of having an unpopular name attached to them. Considered thus, without political prejudice, it seems to me that judicious readers will agree with the 8-circuit model as an admirable creation. It combines all the latest discoveries in psychology, neurology, brain chemistry, sociobiology, etc. and also incorporates and updates the maps of altered states of consciousness to be found in astrology, alchemy, yoga, and similar prescientific disciplines for Brain Change. All in all, this is a book that Lao-Tse could understand and enjoy — after a few scientific terms were explained to him. And 3,000 years from now, somewhere in the Sirius system, seekers of higher knowledge and wider consciousness will still find it useful, after a few of our archaic metaphors are clarified. Meanwhile, everybody can enjoy it and use it right now. Robert Anton Wilson, Ph. D.
Precision cuts through the nonsense to extract the essence. The magical act of extracting essences by thinking, writing and speaking perhaps came from an Olde English word for “magic”, grammarye. Magic, on the other sleight of hand, might simply be the illusion cast by a technology more advanced than we are presently accustomed. The technique behind thinking precisely can be demonstrated with the words WHY and HOW. WHY explains and HOW evokes. WHY gives us the reason and HOW provides the method and action. In our own “grammarye”, where can we discriminate between explanation and evocation? To explain is to answer the WHY question. To evoke is to think, write or speak in such a manner as to trigger the experience of the energy or process in question. Where explaining might kill the spirit involved in an attempt to comprehend, evocation conjures the very spirit forth to be moved by it. The Art of Thinking Precisely is learning to select those words which honor THE EXPERIENCE OF THE ENERGY ITSELF. In the end, it doesn’t matter what we “know” as much as how we can proffer THE EXPERIENCE OF THE ENERGY. ………. 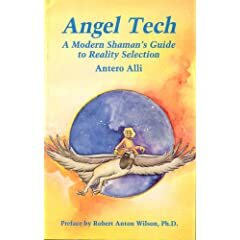 Antero Alli, Angel Tech. Looks like a fascinating read.